The QTableWidget class provides an item-based table view with a default model. Table widgets provide standard table display facilities for applications. The items in a QTableWidget are provided by QTableWidgetItem. If you want a table that uses your own data model you should use QTableView rather than this class. The number of rows in the table can be found with rowCount(), and the number of columns with columnCount(). The table can be cleared with the clear() function. See also QTableWidgetItem, QTableView, and Model/View Programming. 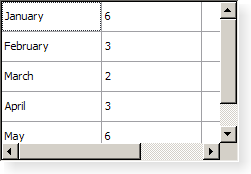 By default, for a table constructed without row and column counts, this property contains a value of 0. Creates a new table view with the given parent. Creates a new table view with the given rows and columns, and with the given parent. This signal is emitted whenever the data of the item in the cell specified by row and column has changed. This signal is emitted whenever a cell in the table is clicked. The row and column specified is the cell that was clicked. This signal is emitted whenever a cell in the table is double clicked. The row and column specified is the cell that was double clicked. This signal is emitted when the mouse cursor enters a cell. The cell is specified by row and column. This signal is only emitted when mouseTracking is turned on, or when a mouse button is pressed while moving into an item. This signal is emitted whenever a cell in the table is pressed. The row and column specified is the cell that was pressed. Returns the widget displayed in the cell in the given row and column. Note: The table takes ownership of the widget. Removes all items in the view. This will also remove all selections and headers. If you don't want to remove the headers, use QTableWidget::clearContents(). The table dimensions stay the same. Removes all items not in the headers from the view. This will also remove all selections. The table dimensions stay the same. Closes the persistent editor for item. Returns the column for the item. Note: Getter function for property columnCount. This signal is emitted whenever the current cell changes. The cell specified by previousRow and previousColumn is the cell that previously had the focus, the cell specified by currentRow and currentColumn is the new current cell. Returns the column of the current item. See also currentRow() and setCurrentCell(). Returns the row of the current item. See also currentColumn() and setCurrentCell(). Handles the data supplied by a drag and drop operation that ended with the given action in the given row and column. Returns true if the data and action can be handled by the model; otherwise returns false. Finds items that matches the text using the given flags. Returns the horizontal header item for column, column, if one has been set; otherwise returns 0. Inserts an empty column into the table at column. Inserts an empty row into the table at row. Returns whether a persistent editor is open for item item. Returns a pointer to the item at the given point, or returns 0 if point is not covered by an item in the table widget. Returns the item at the position equivalent to QPoint(ax, ay) in the table widget's coordinate system, or returns 0 if the specified point is not covered by an item in the table widget. This signal is emitted whenever an item in the table is clicked. The item specified is the item that was clicked. This signal is emitted whenever an item in the table is double clicked. The item specified is the item that was double clicked. This signal is emitted when the mouse cursor enters an item. The item is the item entered. Returns a pointer to the QTableWidgetItem associated with the given index. This signal is emitted whenever an item in the table is pressed. The item specified is the item that was pressed. Returns the item prototype used by the table. See also selectedItems() and QTableWidgetItem::isSelected(). Returns a list of pointers to the items contained in the data object. If the object was not created by a QTreeWidget in the same process, the list is empty. Returns a list of MIME types that can be used to describe a list of tablewidget items. Opens an editor for the give item. The editor remains open after editing. Removes the widget set on the cell indicated by row and column. Removes the column column and all its items from the table. Removes the row row and all its items from the table. Returns the row for the item. Note: Getter function for property rowCount. Returns a list of all selected items. This function returns a list of pointers to the contents of the selected cells. Use the selectedIndexes() function to retrieve the complete selection including empty cells. Returns a list of all selected ranges. Sets the given widget to be displayed in the cell in the given row and column, passing the ownership of the widget to the table. If cell widget A is replaced with cell widget B, cell widget A will be deleted. For example, in the code snippet below, the QLineEdit object will be deleted. Sets the number of columns in this table's model to columns. If this is less than columnCount(), the data in the unwanted columns is discarded. Note: Setter function for property columnCount. Sets the current cell to be the cell at position (row, column). Depending on the current selection mode, the cell may also be selected. See also setCurrentItem(), currentRow(), and currentColumn(). Sets the current cell to be the cell at position (row, column), using the given command. See also currentItem() and setCurrentCell(). Sets the current item to be item, using the given command. Sets the horizontal header item for column column to item. If necessary, the column count is increased to fit the item. The previous header item (if there was one) is deleted. Sets the horizontal header labels using labels. Sets the item for the given row and column to item. The table takes ownership of the item. Note that if sorting is enabled (see sortingEnabled) and column is the current sort column, the row will be moved to the sorted position determined by item. If you want to set several items of a particular row (say, by calling setItem() in a loop), you may want to turn off sorting before doing so, and turn it back on afterwards; this will allow you to use the same row argument for all items in the same row (i.e. setItem() will not move the row). See also item() and takeItem(). Sets the item prototype for the table to the specified item. The table widget will use the item prototype clone function when it needs to create a new table item. For example when the user is editing in an empty cell. This is useful when you have a QTableWidgetItem subclass and want to make sure that QTableWidget creates instances of your subclass. The table takes ownership of the prototype. Selects or deselects the range depending on select. Sets the number of rows in this table's model to rows. If this is less than rowCount(), the data in the unwanted rows is discarded. Note: Setter function for property rowCount. Sets the vertical header item for row row to item. Sets the vertical header labels using labels. Sorts all the rows in the table widget based on column and order. Removes the horizontal header item at column from the header without deleting it. Removes the item at row and column from the table without deleting it. Removes the vertical header item at row from the header without deleting it. Returns the vertical header item for row row. Returns the visual column of the given logicalColumn. Returns the visual row of the given logicalRow.